Nature is out of balance in the human world. The sun hasn't shone in years, and crops are failing. Worse yet, strange and hostile creatures have begun to appear. The people's survival hangs in the balance. To solve the crisis, the oracle stones are cast, and Kaede and Taisin, two seventeen-year-old girls, are picked to go on a dangerous and unheard-of journey to Tanlili, the city of the Fairy Queen. Taisin is a sage, thrumming with magic, and Kaede is of the earth, without a speck of the otherworldly. And yet the two girls' destinies are drawn together during the mission. As members of their party succumb to unearthly attacks and fairy tricks, the two come to rely on each other and even begin to fall in love. But the Kingdom needs only one huntress to save it, and what it takes could tear Kaede and Taisin apart forever. The exciting adventure prequel to Malinda Lo's highly acclaimed novel Ash is overflowing with lush Chinese influences and details inspired by the I Ching, and is filled with action and romance. 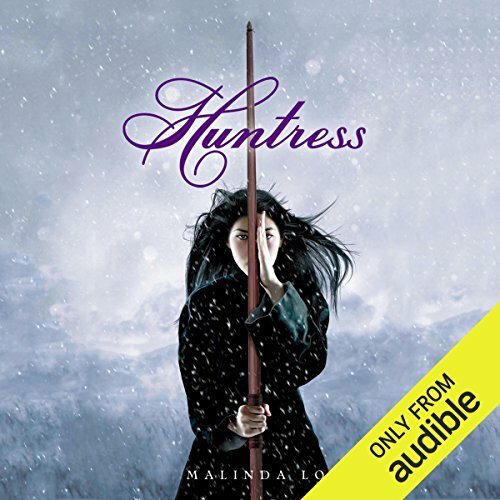 ©2011 Malinda Lo (P)2013 Audible, Inc.
scenes of genuine tension and character growth. conclusion: pretty good, would recommend. The narration is so rough on this one that I couldn't bear it for a whole chapter, unfortunately. Just bland, uninspired, unemotional, slow. Almost like a computer reading to you. Captivating queer YA fantasy novel! A much appreciated reprieve from daily life under late capitalism. Felt kind of like a love story between Katniss Everdeen and Hermione Granger- with POC characters, emotionally complex content and no gratuitous violence. I enjoyed Malinda Lo’s narration. The ending felt a bit rushed, but still left me thinking. I have never read a book by this author before but this particular book struck me is very interesting and I had tried several times to rent it from my library without any success for it was constantly checked out. I was very glad to find it available on Audible. From the moment I first started listening to it I found it hard to put down. Because I was able to listen to this weather I was near an internet connection or not I didn't have to put it down very often, lol. Loved this book from beginning to end. The characters are awesome and the story will keep you reading. I can't wait to read another book by Malinda Lo. What made the experience of listening to Huntress the most enjoyable? Kai De. I loved her arch and her growth- how she struggled with events that would ordinarily get brushed over in other YA fantasy novels (the reality of taking life, for example.) I also appreciated that neither girl had the Gay Panic Crisis- but rather, the panic of wondering if their feelings came naturally, or because they were fated. Which character – as performed by Malinda Lo – was your favorite? Khan, probably. Got to love the side character that keeps the others grounded. I liked the idea of the story but it's fluffed up with a lot of extra description and characters that feel hollow. The sudden POV changes were a bit much and the narration was pretty bland. I was going to read Ash but I think I'll pass on that now. The story has everything. There were times I felt terrified for the characters, angry for them, excited and cheerful with them, I definitely fell in love with them. The reading is done by the author and is not acted out which makes it different from other audible books. I'd have loved to hear actors for a more immersive experience but that's not the authors choice so I'm glad she made it possible for us to listen even without them. Don't let that be the reason you pass up this incredible book. I loved the story and all the characters by the end even the villain. At times I was crying, at others I was so happy for the growth of each of the characters. Throughout the story I felt like I was there in world with the characters feeling all of what they felt. I have listened through only once but this is a story I will return to and will read thoroughly again and again. I was completely consumed by Huntress. The world Lo creates is vibrant, compelling and heady. a better reader. just had a hard time with who was talking. Would you be willing to try another book from Malinda Lo? Why or why not? maybe the story was ok.